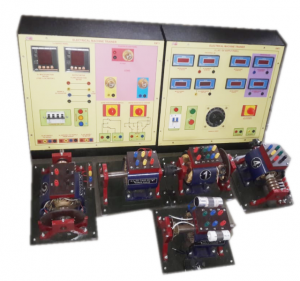 SALIENT FEATURES TECHNICAL SPECIFICATIONS: Suitable for demonstrating the construction and functioning of different type of D.C. machines and A.C. machines (1 phase and 3 phase). The trainer made of well machined M.S. / Bakelite 12 mm thick base plate. The plate fitted on M.S “C “ channel of 70X40X6mm. The bearing housing spilt type and prepared from aluminum casting. Trainer includes Following 6 Machines & Control Panel. 2) MACHINE NO.2 3 PHASE SQUIRREL CAGE INDUCTION MOTOR Working voltage – 110V 3 phase, 50 Hz Capacity – 300 watt, R. P. M. – 1400 Connections – six terminals are provided on terminal plate using banana terminals. 3) MACHINE NO.3 A.C. SINGLE PHASE CAPACITOR START MOTOR With centrifugal switch arrangement working voltage – 110V, 50 Hz Capacity – 300 watt R.P.M. – 1440 Connections – 2 terminals of starting winding and 2 terminals of centrifugal switch and 2 terminals of capacitor, two terminals of main winding ,total of 8 terminals brought out on terminal plate using banana terminals. 4) MACHINE NO. 4 3 PHASE SLIPRING INDUCTION MOTOR Working voltage – 110v, 50 Hz Capacity – 300watt R.P.M. – 1440 Starter – suitable rotor resistance starter. Connections – Terminals are brought on terminal plate by banana terminal. 5) MACHINE NO. 5 3 PHASE ALTERNATOR Type – Rotating field type Rotor – Salient pole type with field coils Output Voltage – 110V, 3 Phase, 50 Hz R.P.M. – 1500 4) MACHINE NO. 4 3 PHASE SLIPRING INDUCTION MOTOR Working voltage – 110v, 50 Hz Capacity – 300watt R.P.M. – 1440 Starter – suitable rotor resistance starter. Connections – Terminals are brought on terminal plate by banana terminal. 6) MACHINE NO. 6 3 PHASE ROTARY CONVERTOR AND INVERTOR Consisting of field pole and field winding working voltage – 110V, Capacity – 300WAC/DC Suitable terminals are brought on terminals plate with proper banana terminals.